← Sunday Coffee – Happy Father’s Day! 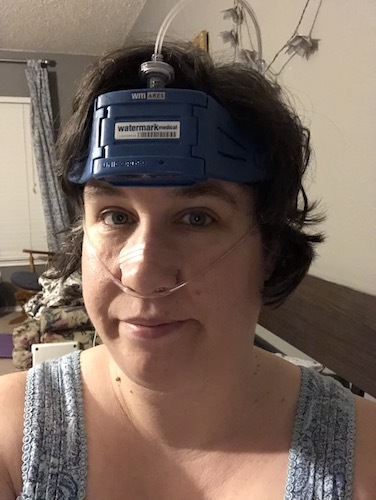 Sooooo…I had a home sleep study last night, and honestly I have no idea how doctors get useful data from these things. It took me twice as long as normal to fall asleep, and then I woke up every 10-15 mins for the first three hours of the night. The one time I changed positions without getting all the way out of bed, the monitor started an alarm to have me adjust the device on my face. Eventually I got to where I was only waking up every 30-60 minutes, but that still meant getting up far more often than usual, plus sleeping stiffly so I wouldn’t dislodge the device at all. The shortened sleep periods meant I got no deep sleep, but instead these shallow dreams that all involved being able to take the stupid thing off my head. I “slept” from 11 to 6, but probably only got 3-4 hours of shallow, restless sleep. This morning I feel like I’ve been hit by a car. My body is stiff, I’m having mild hallucinations, I can’t walk straight, and my lungs and throat are reacting as if to bad allergens. Thank goodness Jason has the option of working from home because I would not be remotely safe to drive today, and the boys have a few appointments. To add a few details for my own record here, not on Facebook: When I “woke” up at the end of the night, my face was very swollen. The tubing that went into my nose was snug but not tight enough to cause indentations (see pic above), but my skin swelled enough in the night to cause deep grooves to be left on both sides (not just the side I was lying on). My lips, nose, and eyes were puffy. I’ve had this kind of sleep-puffing before, but usually only after extremely hard interval workouts during the day (especially ones that take place while swimming – this used to happen a lot during high school when I was a competitive swimmer, for instance). My joints and glands are all swollen, again like I’m having an allergic reaction. I’m coughing, my throat is almost swollen shut, and it’s hard to swallow. I’m not sick, but have this as a result of lying too stiffly and not getting any deep sleep. I do plan to try to nap at some point, after the swelling in my face goes down. And I really don’t want to take another sleep study ever again. Sheesh. This entry was posted in Wellness and tagged health. Bookmark the permalink. Yikes that sounds awful. And it really does confuse me how they base their study on one night of sleep. Surely monitoring for like a week would get a more accurate result? Not that I want you to go through that again but how confusing. I do hope you managed to get a nap later though- your poor face! I’ve had a lot of people assure me that indeed they can get lots of data from it. So I guess we’ll see! I did manage a two-hour nap, but sadly that threw off last night’s schedule, and I”m on the third day in a row with less than 6 hours sleep now. Sigh. I always wondered about sleep studies. Most of the ones I know involve going someplace to sleep under observation. Given how rarely people sleep well in hotels, I cannot imagine how accurate these are when you are in a strange room in a strange bed knowing you are being observed. Not to mention the wires and tubes attached to you. It seems like a surefire way to guarantee inaccurate results, but what do I know!?! My sister and mother both had those kind of sleep studies and both said they were extremely uncomfortable. Supposedly they want to do one of those on me depending on the results of this one. The insurance just wanted this one first. I think they take into consideration the uncomfortableness of the machine when they analyze those sleep patterns from what I imagine. I’m sorry to hear about the swelling and I really hope it goes down and you get back to normal. What I’m shocked about is most sleep studies usually monitor the subject for a minimum of 3 days to get a better array of data, anyway I wish you comfort until they figure things out but I will say that I believe in you and you have already been thru so much yet you keep grinding and fighting and for that I will always be in your corner, my friend! If there’s anything I can do to help it goes without saying but I will for the record, I’m in because you deserve as much support as you can get! I imagine they do as well, but still, you’d think they’d have to get access to SOME deep sleep to really analyze the patterns. But thank goodness I don’t have to do that three nights in a row!! Do you think you could have an allergy to plastic or rubber? It really does sound like an allergic reaction, maybe there is something touching your skin that is a common element to when you were swimming in school? No, no allergies. Do you mean the swelling part? It happens any time I do intense interval training, regardless of setting. I think it’s a hydration thing – my body retains a lot of water after intervals and then my entire body gets puffy at night. Then it drains off the next day. I saw it a lot in my swimming days simply because we did intervals every couple days. My body doesn’t like interval training, I’ve discovered, so I rarely do it these days. As for the swelling the other night, I imagine it was purely because I had something wrapped around my head, which makes me tense up at night, and I couldn’t move positions when I usually move around quite a bit. Severe insomnia and not getting any deep sleep also causes me to get puffy at night, so that’s probably all it was. Ah…yeah it sounds like a really bad allergic reaction. I’d never heard of that relative to any kind of exercise before. Hehehe, you’re allergic to interval training apparently. Well, I hope they get everything sorted out. Insomnia is gods awful all by itself and I don’t think I could sleep at all with that head gear on either. Have you ever checked out Damon Ashworth’s blog? He’s a psychologist that does a lot of writing about insomnia and sleep studies, over in the U.K. Let me know I’ll link you his blog.